The Society gets involved in many projects. 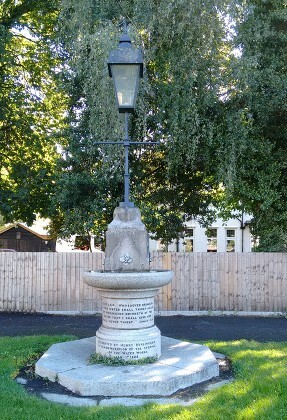 One of the most interesting ones is the old Drinking Fountain by the roundabout at the junction of Broadway Road with Elm Road. 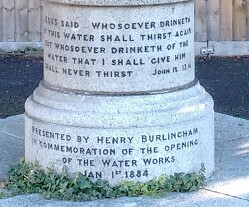 The Society has already arranged to have the lettering repainted so now it can be read and the historical significance of the fountain can be understood. The next step will be to reconnect the fountain to the water supply so it works once again. We want to bring back the old horse trough currently in the Almonry Museum Garden. Finally a small garden is planned to make this corner of Bengeworth just a bit nicer. The statue in the Market Square near the entrance to the Natwest Bank is controversial. Whatever its merits as a work of art, it is an enigma for visitors unfamiliar with the Eof legend. 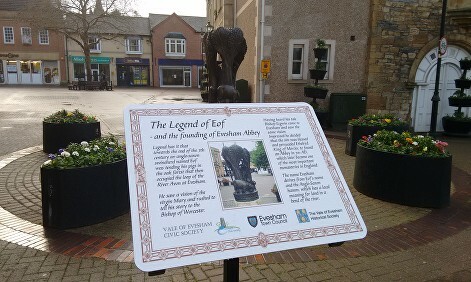 As a result of a Civic Society initiative an explanatory panel, funded jointly by the Civic and Historical Societies, has been erected at the entrance to the Square recounting the legend and explaining its significance.